I rarely get sick, but when I do, I do it right. This was the case over Christmas when we traveled home to Ohio to spend the holiday with my family. Christmas Eve I started to feel unwell and it only continued as the holiday went on. Christmas stretched into New Year’s and New Years stretched into the first full week of the new year. By the 4th of the month, I still wasn’t feeling better. That meant a doctor visit. While I do favor using natural remedies to heal yourself when you’re sick first, there does come a point when you have to just give it up and go see a doc. By the time I reached that point, I could barely breathe because my lungs were so congested. I could barely even speak because I would begin to cough so badly when I did that it was much easier to stay silent and eventually I had pulled muscles in both my back and my abs from coughing so much. I’m lucky that over the years I have learned how to save on medical bills because this could have turned into something quite serious had I not gotten it taken care of. We have no health insurance. Why? Because it would run my family $800 or more each month to cover us. The simple fact is that it is cheaper for me to take any fines that I receive on my taxes than to pay that $800/mo. This isn’t normally an issue as I can treat most illnesses at home with a natural remedy but when we can’t, we simply pay cash out of pocket when visiting the doctor. Normally not an issue, but this month? I simply didn’t have the extra cash to spare. We keep an emergency fund set aside solely for medical expenses but we had used it last month on something unrelated. That emergency fund is key to being able to save money on medical bills so it was quite discouraging to not have it available for use. I’m sure that we can’t be the only ones who are without insurance and have been forced into learning how to save on medical bills. There are a lot of ways to do that, but one of my favorite is by actually visiting the doctor less. No, I don’t mean ignoring health issues that need to be addressed by a medical professional. I mean spending less time actually sitting in a doctor’s office. The average cost for a new uninsured patient to see a doctor is $160.00. (source) While that doesn’t seem like a lot, if you visit the doctor just 10 times a year, you’ve just dropped an average of $1600.00. Maybe it isn’t for you, but that is a lot of money to me. Since we’re not insured, we had to find a different way to save on medical bills. A while back, we had the opportunity to sign up for the Careington Telehealth Plan. This plan, while not insurance, does provide us with discounts on telehealth visits, dentist visits, prescription discounts and more. For just a couple hundred dollars each year, we can save as much as 60% off of the dentist and eye doctor and score free telehealth consultations. If you’re not familiar with what telehealth is, you’ve really been missing out. Telehealth is exactly what it sounds like. A doctor visit over the phone. With our Careington Telehealth Plan, we receive our services through TeleDoc, is super simple to use and is a fantastic way to save on medical bills. Request your doctor visit, wait a few minutes, speak with the doctor and pick up any prescriptions you might have needed. It’s all super easy and fast! After you sign up for the Careington Telehealth Plan, you’ll need to register for your Teledoc account using the username that Careington gives you. If you’re like me, you’ll have to call to get yours, but it was a super simple call that took less than 5 minutes. After you’ve registered, download the Teledoc app to your iPhone or Android phone. 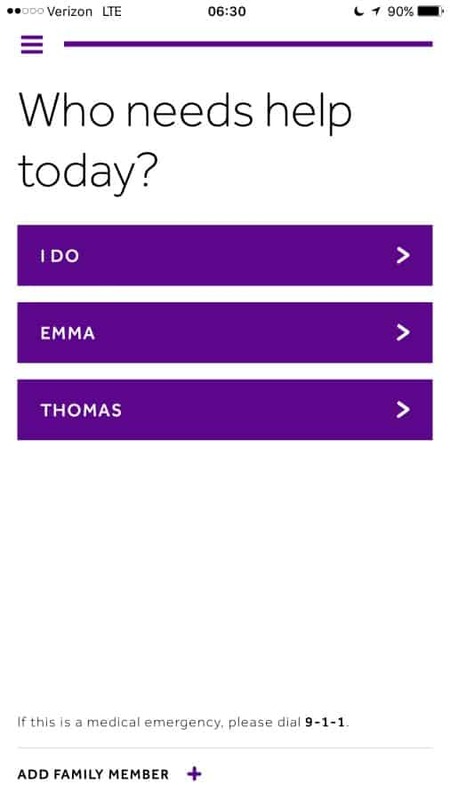 After you’ve registered and downloaded the app, open it up and click request a visit. Yours won’t have a message attached like mine is showing. I did these screengrabs after I had done my visit so that is my prescription information. I’ll tell you about that in a few. 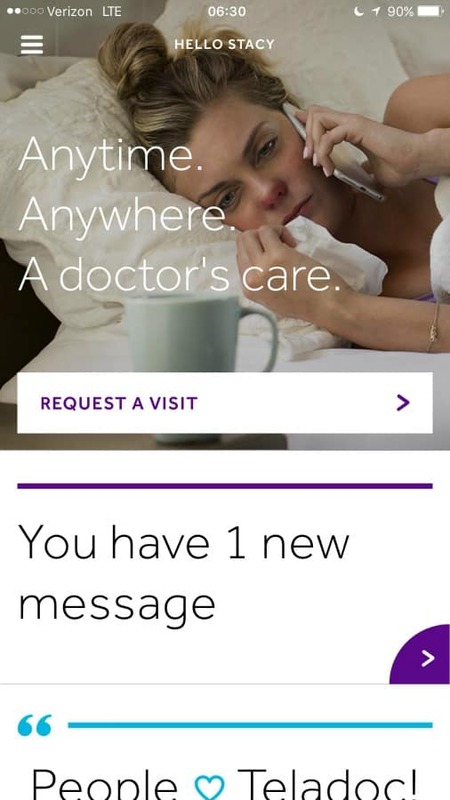 The app will then ask you which family member needs to be “seen” by the doctor. If you need to add a family member, you can. It will ask their basic information and a bit of their health history. 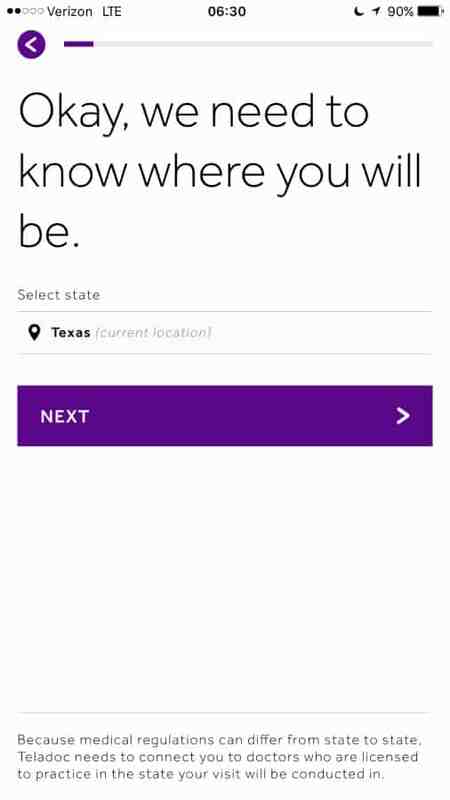 Next, tell the app what state you’re in. 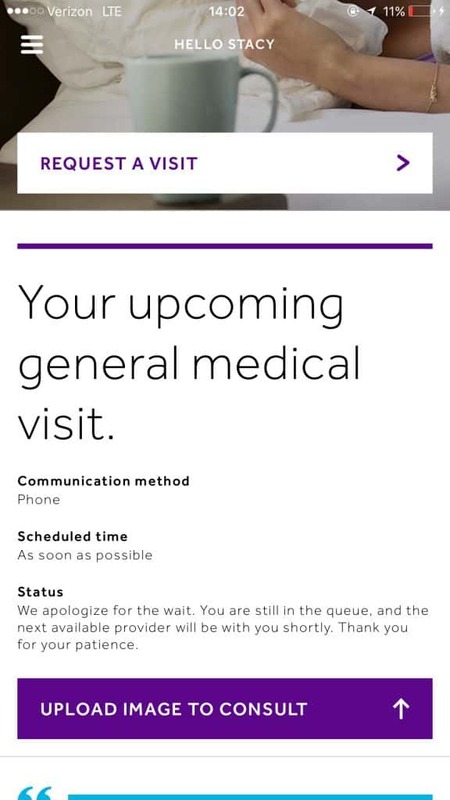 As it explains at the bottom of the screen, medical laws are different in each state so you will need to be treated by a doctor who is in the same state that you are. In my case, that is currently Texas. Tell the app what the best way to contact you is and the best time. Then, add any special info your doctor might need and schedule. You’re good to go at this point! Your doctor will call you back within a few minutes! Speak to him or her and you’re done! My phone call took less than 5 minutes. In that time, he asked what my symptoms were, if I was feverish (I wasn’t) and confirmed that I have had issues with asthma in the past. While I was speaking with him, I happened to take a coughing fit so he was able to hear exactly what was going on. He called in a prescription for my Albuterol inhaler and Prednisone tablets. Thirty minutes later I had my medicine and was on my way to feeling much better! I’ll say it again. The Careington Telehealth Plan is not insurance. What it is though is a fantastic way to save on medical bills for people who, like me, simply can’t afford health insurance at current prices. It was quick, it was easy, and even better? 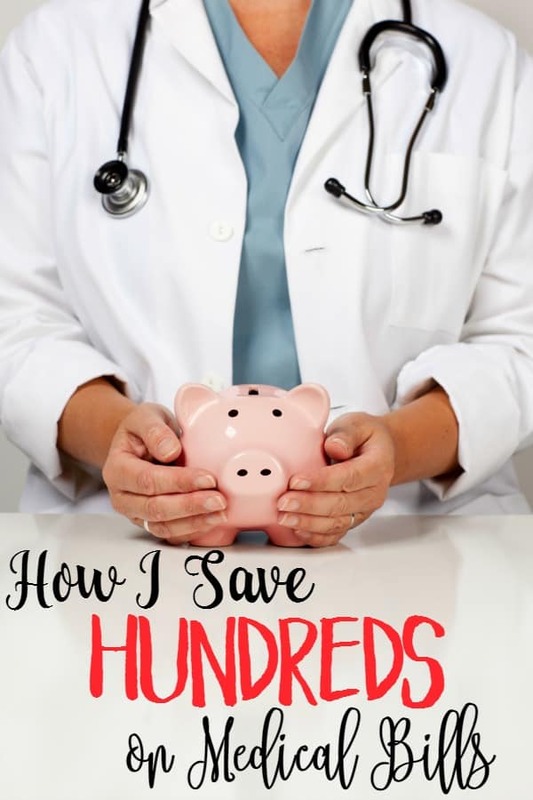 I was able to save hundreds on that doctor visit and never leave my home to do it. What would you do for an emergency or hospital stay? I am considering Samaritans purse, but haven’t taken the”plunge”as of yet. Sharon, for those larger expenses we have a health savings account and an emergency fund that we fall back on. I’ve heard good things about Samaritan’s Purse but we haven’t made the jump to them yet. They’re almost as expensive for us as “regular” insurance so the co-ops don’t seem to be a viable option for my family.